I’ve been dabbling with Google Maps recently as I want to download some GPS data from my PDA to visualise and analyse journeys that I have made. I also think Google Maps and its 3D sibling Google Earth are the absolute dogs doodads of applications and so any excuse to play with these was welcome. I started with a .GPS file that was generated automatically by Copilot, which is the in-car satellite navigation software that I use. It’s pretty good, but like all Satnav systems you need to be aware of its foibles to get the best out of it. Never, ever, simply follow the instructions! The GPS track was a record of my travels on Monday 25th June as I tried to get into work in Sheffield as it was getting hit by freak floods. Getting in was OK(ish), but took a long time. Getting home again was a bit more interesting as I kept trying to avoid all the bad traffic. Anyway, since I was being forced to turn around and try new routes to avoid flooded roads, jams etc, I wanted to see on my PC where I had been. What I did not know was a quick and easy way to do it. 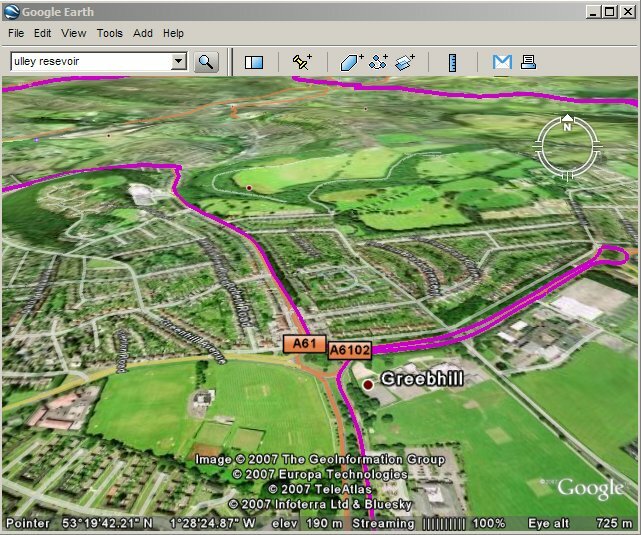 Copilot has a PC hosted planning application, but that won’t take the GPS tracks that the PDA version generates (sigh….). Ideally I wanted to put the tracks into Google Earth to look at in glorious 3D, but I currently only have the free version that does not allow GPS tracks to be imported. A quick webhunt brought up GPS Visualizer. This provides a free service that allows me to upload the GPS file, and it generates a Google Map with a vector overlay of the results. Even better, the site contains instructions on hosting the resulting map on your own website. Open HTML with an editor. Even Frontpage could manage this bit! Locate the Google API key, and replace it with my own (see below). The resulting page can be seen here.